The childhood of Keiji Nakazawa dies on a sunny monday morning. The biggest mass destruction weapon of human history is thrown at the Japanese town Hiroshima. 20 years after the incident Nakazawa begins to work up the gruesome events of his childhood and begins to draw manga. 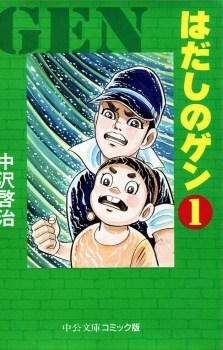 Hadashi no Gen was first published in English as Gen of Hiroshima in comicbook format by EduComics, in cooperation with the pacifist organization Project Gen, a group of voluntary translators that sought to bring the manga to a larger audience. Volunteers around the world likewise picked up this project, partially translating this title into French, Italian, German, Portuguese, Swedish, Finnish, Norwegian, Indonesian, Tagalog and Esparanto, and by 1994, completely into Russian. In English, originally only two comic book issues were released between January 1980 and April 1981, before the publication was cancelled. Since then, a number of publishers have partially published this series as Barefoot Gen, including New Society Publishers, who published the first four volumes from September 3, 1986 to December 1, 1993; Penguin Books, who published the first two volumes from August 1, 1989 to August 1, 1990, under the Penguin Originals imprint, with a new edition published July 27, 1995; and Last Gasp, who started publication from September, 1986, initially only publishing the first four volumes, but after the revival of Project Gen, finally published all ten volumes unabridged (with subtitles) from September 1, 2004 to February 1, 2010. I am very proud to say this is the first of manga mangas I will read. It captivated me from the very beginning, and to tell the truth I was at the mere age of nine when I read it. I was shocked to say the least that there was no reviews for this breath-taking manga, so I'll try my best to do its justice. Like I said I first read this when I was nine, my Mum gave it to me when her regious group's libary was being re-done, they cleared out the books they didn't want anymore and gave them to the people who wanted them. The book was old and battered to say the least, the pages read from left to right instead of right to left like most mangas you find in your local book store nowadays. So at the time I just thought that it was just a normal comic book. It wasn't until years later when I got into anime and manga I realised that it was a manga. The story does not just follow what it was like for the innocent people who were hit by the atomic bomb in Hiroshima, but of the lifes of Hiroshima living in a country at war and full of hate. The plots follows a anti-military family and the prejudices and hatred their neighbours hold hold for them, though, a couple, are nice to the family. The art is not the best to look at. The lines are harst and none of the characters are visually 'actactive'. However, Kenji Nakazawa is a good artist, he is not one of those shoujou mangakas whos art maybe pretty but you find it hard to read. Nakazawa-sensei's art work is simple and easy to read, and no two characters are the same. The characters are unique, all character designs are completely different and same goes for their personalities. I loved reading this, I honestly did. I'm forever reading this, and it is most deffinately going to be with me for the rest of my life. A brilliantly visual novel, a must have for any person interested in history, Hiroshima, atomic bombs, and just loves their manga. I highly recommend reading it, I promise you won't regret it. We only managed to cover 1 volume, but I found the story very enticing and intriguing. The artwork on this book is very detailed for a very old manga and also, there is some comedy, which kept my classmates drawn in throughout the story. You will definitely feel different emotions, especially at the end of the book, where a tragic incident occurs, just like the nuke that landed on Japan, bringing war to an end. Hadashi no Gen is just the most heart-breaking, sad, gritty and tragic story that I can think of. It is the kind of story that really changes you as a person. It makes you see the world differently. Hadashi no Gen is the tragic story of Gen and his family, who suffered deeply the effect of the atomic bomb. The author lived in Hiroshima in 1945 and he was six years old, so this is not fiction. This story is not fruit of imagination nor speculation. It is a true narrative of the Hiroshima bombing and the tragedies it caused to hundreds of thousands of people. Hadashi no Gen is absolute terror, despair, sadness and dread. But it is also redemption and hope. This work is a must-read for every human being. Humans need to learn from their mistakes, and reading Hadashi no Gen is one way to do it. Almost everything is outstanding in this manga: the story, the art and the quality of the characters. Because of the tragedy involving the story, some of the moments are really not enjoyable to read. But a while after you finish it you can enjoy the story, if you are able to accept the fate of some characters. In the end, one cannot turn his/her back to the truth. Although the names of most people were changed to the story, all of them were based on real people that lived with Nakazawa Keiji. The tragedies depicted really happened. One can say Hadashi no Gen is an anti-war work, but it's actually more than that. It also criticizes the abusive Japanese society. This work also deglamorizes the traditional Japanese society, pointing out the injustices that existed during that time. Sometimes in Hadashi no Gen the real enemy was not the bomb, but the very Japanese people. I still haven't read the entire story, but there's a reason for that. I was simply unable to find scans on the Internet (maybe I'm not good at finding things). The 10 volumes were published in my country (Brazil) but it was a limited edition. I was only able to read until Volume 6 (which was enough to make me love it). Very recently, I was able to purchase the remaining four volumes, and I intend to read them very soon.